The University of Rochester has received federal funding to expand the reach of its programs that engage underrepresented minority, low-income, and first-generation students in science and engineering. With a $300,000 grant from the National Science Foundation, the University will demonstrate how faculty involvement in its Upward Bound precollege program is a model for introducing at three sister institutions in upstate New York – and perhaps nationwide. The funding is part of a new NSF program known as INCLUDES. Another $380,000 NSF grant will allow underrepresented engineering students from other institutions to do summer research at Rochester, in a program that closely mirrors one that has prepared many of the University’s own engineering students for graduate school. The University is one of only 37 institutions nationwide to receive INCLUDES funding from NSF, says Beth Olivares, who is the principal investigator for both grants, and serves as the University’s dean for diversity and as executive director of the Kearns Center for Leadership and Diversity in Arts, Sciences & Engineering. 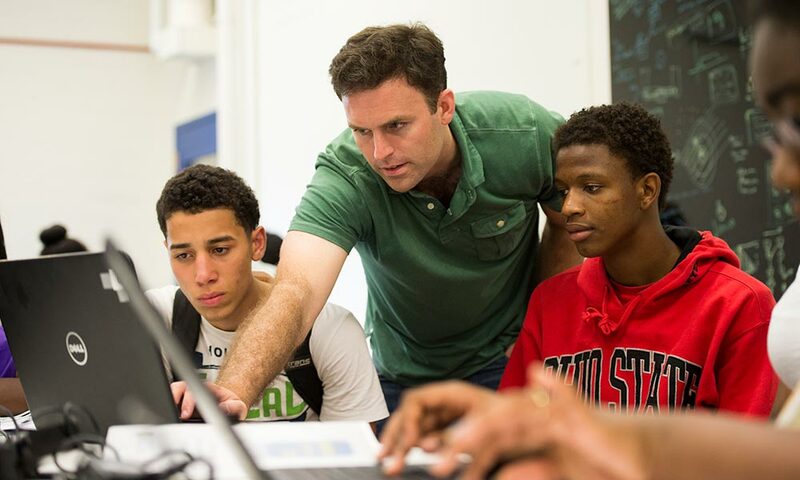 The program is designed to develop “bold, new models” that broaden the participation of underserved student populations in science, technology, engineering, and math. The University will share what it has learned from its Upward Bound program with its collaborators, who also have Upward Bound programs: Monroe Community College; D’Youville College, an undergraduate institution; and Cornell University. The goal is to demonstrate proof of concept across a range of academic settings, in hopes of eventually applying the Rochester model nationwide. Why is Rochester a model? The University’s Upward Bound program, administered by the Kearns Center, is now in its ninth year. It involves Rochester City School District high school students in year round activities on campus, including summer sessions and a math and science component. Though less than half of the district’s students graduate, 95 percent of its students who participate in the Upward Bound program end up going to college, says Olivares. A key part of the project will be to help faculty members at the collaborating institutions learn and develop way to manage a wide variety of diversity in their classrooms. “Everybody has to learn, not just the student,” Olivares says. “We all have to be more aware of what we’re doing, and not make so many assumptions about where excellence resides. Poverty is not an insurmountable obstacle to living a full, educated life. The Kearns Center has also had success in preparing underrepresented minority, low-income, and first generation undergraduates in science and math for the next stage of their academic growth: attending graduate school. For example, since 2009 the center’s Xerox Engineering Research Fellows Program has given rising juniors and seniors in the University’s Hajim School of Engineering & Applied Sciences a summer hands-on, faculty-mentored introduction to the kind of research that is integral to graduate work. The research experience is combined with professional development and GRE exam preparation. Thirty-nine percent of the 184 students have been female and 24 percent have been underrepresented minority students. About 60 percent of Xerox fellows have subsequently enrolled in graduate school. With funding from the other NSF grant, underrepresented minority and women engineering students from other institutions will be recruited to participate in a summer REU (research experience for undergraduates) that mirrors the Xerox program. The hope is that many of these students will choose to apply to Rochester for graduate school. “They will have had a great experience here. They will have lived here for a summer. And they will have met a lot of different people,” Olivares says. For example, the students will have lunch each week with a different Hajim School faculty member, hearing about his or her research and career. Unlike most REU programs, which are limited to single departments, this one spans multiple departments within the Hajim School. And it will be administered by the Kearns Center, not an academic department, which broadens the scope of the program. 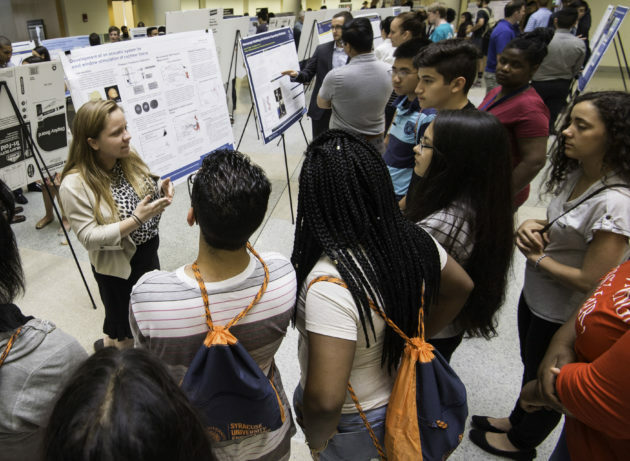 “The REU students will participate alongside our own Xerox fellows, doing research in the lab and taking professional development courses, exploring topics ranging from the culture of the academy, to the responsible conduct of research, to entrepreneurship, as well as having access to our GRE prep program,” says Wendi Heinzelman, dean of the Hajim School, who is a co-principal investigator for both grants.